Do you have employees? Then you know the feeling when one of them resigns and you didn’t see it coming. It happened to me recently and I wish I would have known about it earlier. Maybe I could have done something about it. 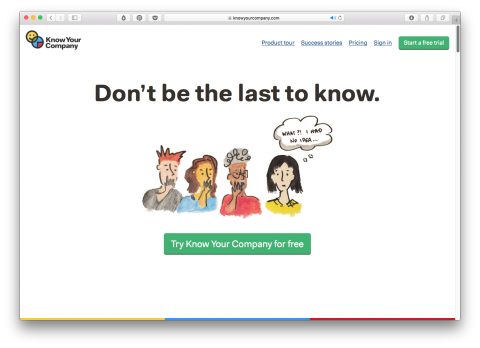 Know Your Company helps you find out how your employees feel about your business, the work, the culture, etc. You’ll be able to address issues before they turn into bigger problems. I will definitely give this a try! Thanks for pointing me to it, Jason! So, a website is going to replace you walking up to your employees once in a while and saying, “Hey, how are you doing? Wanna grab coffee, I’m always looking for ways to improve around here and want to make sure everyone has a voice”? How many employees do you even have? I’m sorry one of them left but I feel no empathy for your situation. Even you said you could have done something about it. But this website is NOT a replacement for actually caring. Maybe this product isn’t for the organization Erik is thinking of. My company was acquired and our office closed, (everyone just WFH) so this tool could be an effective way to combat isolation of teams and individuals. Our management pretty clearly doesn’t care how we’re doing, which is the real issue. If your management doesn’t care how you’re doing, why are you working there? Clearly, you’re replaceable in their eyes if they don’t care about how you’re doing so I suggest quitting and finding a company that does care.